Even as the world economy skids, pearls remain popular. Maybe that’s because in times of crisis, we find comfort in tradition and investment classics like cultured pearls. Pearls lift us up and bring elegance to everyday life. 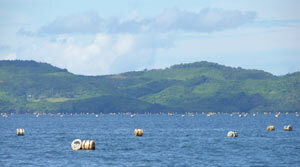 In nutrient rich seas far from civilization, buoys support long lines holding nets of Philippine golden South Sea pearls. - Photo by Mona Lee Nesseth. Pearls are organic gems, of course. But in this time of ecological sensitivity, can we enjoy our pearls and the environment too? Is there an ecological price for pearl production? While researching the answer to that question, I’ve drawn on my 30 years as a pearl importer and wholesaler and two recent GIA cultured pearl tours of the South Pacific and Asia. What I’ve learned is that the environmental impact of pearl culturing and how the environment affects the pearls in return varies depending on the type of pearl. Saltwater oysters have strict tolerances for growing conditions. As a result, farms are developed in natural habitats far away from civilization. Growers prefer remote bays, lagoons, and channels, providing sheltered areas rich in nutrients and abundant plankton to nurture their crops. Maintaining the health of surrounding waters is critical to the success of the industry in Australia, Tahiti, Philippines, Japan, and New Zealand. Pearl farmers understand that the health of the pearl is an indicator of the state of the environment. Quotas for collecting wild stocks effectively protect species of wild oysters, Pinctada maxima in Australia, and Haliotis iris (abalone) in New Zealand. In the 1970’s, Japanese pearl farmers became oyster farmers too, establishing hatchery-bred akoya or Pinctada fucata. Philippine South Sea golden pearl farmers have also successfully bred their own crop of Pinctada maxima oysters, since 1989, according to Jacques Branellac, Jewelmer’s managing director. From December through March, most farms in Tahiti are on a cleaning cycle to maintain optimum growing conditions for Pinctada margaritifera. “French authorities monitor any foreign algae species and go to the spot to determine origin and set up corrective action,” explains Bruno Wan of Robert Wan Tahiti. Pearl farmers are often the leaders of the local environmental movement. They have to be vigilant or the oysters, and pearl quality, will suffer. “All companies apply the industry environmental code of conduct which manages waste products from human activity, animal welfare, and vessel movements,” says Brett McCallum of the Pearl Producers Association, Australia. Pearls are not all that pearl farms produce. First the farms harvest pearls, then the shell, and then the meat. Every pearl producing country sells shells as specimens and uses mother-of-pearl for inlay in furnishings, craftwork, tableware, accessories, and jewelry. In Japan, ashes from burned shells and dried meat become fertilizer. Pearl oyster and abalone meat are often sold both fresh and canned as a delicacy. Jewelmer takes environmental activism a step further by proactive involvement with the Philippine government in the Save Palawan Seas Foundation, which offers the local community assistance in developing skills, modifying environmentally destructive habits, and education. The goals are to develop opportunities for economic livelihood while maintaining long-term sustainable use of the marine and aquatic resources of coastal communities. Pearl farmers in Japan are also supporting efforts to revive local waters, joining the local government and citizens in the Council of Revival of Nature in Ago Bay. You can think of the mollusks of the Mississippi and Tennessee River systems as canaries in the ecosystem. Pearl cultivators in the U.S. view monitoring the environment as an essential part of their responsibilities. “We keep a close watch on the water quality and content,” says Gina Latendresse, president of the American Pearl Company. “It is to our advantage that the waters be in optimal condition for mollusk growth so we report often and stay in constant contact with governmental agencies.” Once pearls are harvested, the meat is used as fish bait, an additive to animal feed, and in composting. Shells are used to make nuclei for pearl cultivation throughout the world. Soda-bottle freshwater pearl farms coexist alongside multistory homes, agricultural fields, and farms in provinces along the Yangtze River in China - Photo by Betty Sue King. The legacy of the Wild West is a memorable part of American history and culture. China is the new Wild East pulsating with unbridled growth and expansion, one that has positioned pearls as a commodity accommodating any and all budgets. As you travel inland from Shanghai, a patchwork of pearl farms increasingly blankets the countryside. Although free from state controls since the early 1990’s, China requires that farmers be licensed to cultivate pearls. Soda bottles recycled as buoys support countless cages of Hyropsis cumingii, freshwater pearl mussels alongside multistory homes, agricultural fields, and farms. Byproducts from soybean production mixed with pine tree soil and chicken or pig manure are poured into the water to grow plankton which in turn nourishes the mussels. “Farmers cultivate freshwater pearls for five years. Then they will let those lakes have a break of one or two years. During this period, those lakes will be used as fish farms,” says Cheng Tai Po, vice chairman of the Man Sang Group and director of China Pearl & Jewelry City, a massive new development in China with the ambition to become the center for world pearl trading. At harvest, the complete innards of the mollusk, pearls and all, are scooped into a pearl sluice. Water is hosed in and the device spins, dislodging pearls from mantle tissue. After the pearls are separated, salt and detergent are added to clean the pearls. Bleach and chemicals are used to lighten and stabilize colors and dye to add new colors. Polishing compounds provide the finishing touches. The meat is sometimes frozen for feeding fish and shells are sold to arts and crafts factories. Production is not governed and there are no regulations controlling disposal of products used for processing pearls. With ample labor to work the farms and a compliant and prolific native mussel that tolerates less than perfect conditions, growers have been able to cash in on the market potential for Chinese pearls. With many eager to profit, lakes have become burdened with baskets overloaded with mussels, fouling waterways. While laissez-faire is the basic attitude of the government, even they have been encouraging farmers to make adjustments. With the downturn in the economy, many have stopped farming and those remaining plan to reduce pearl cultivation by at least one-third this year. Farmers have cut back on harvesting and are leaving mussels in the water to grow longer. The reduction in freshwater pearl production and harvest may give overworked waterways the time needed to regenerate. Even so, pearl producers in China will eventually have to address the byproducts of freshwater pearl processing. In contrast, saltwater mollusks dictate that farmers practice environmental protection or suffer poor quality yields. Pearl cultivation and its byproducts are carefully monitored and regulated. Intense efforts are made from Tahiti to Japan to not leave behind a carbon footprint that would alter the conditions in which saltwater pearls grow best. 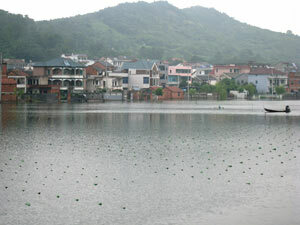 But even with freshwater pearl farming in China, pearls have the potential to benefit the areas in which they are produced. In contrast to gems and precious metals, no dynamite is needed to mine, no shafts or holes are dug, no heavy metals are needed to refine, and there are no “blood pearls.” The meat can be used for feeding fish and people. Shells are sold for use in numerous crafts and jewelry. In most cases, virtually the entire mollusk is used. In the end, we can add “green” to the endless palette of lustrous pearls.